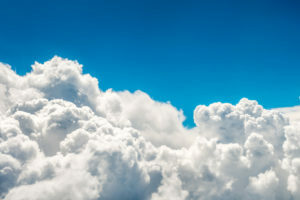 Weather is the state of the atmosphere, describing for example the degree to which it is hot or cold, wet or dry, calm or stormy, clear or cloudy. Most weather phenomena occur in the lowest level of the atmosphere, the troposphere, just below the stratosphere. 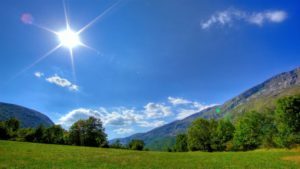 Weather refers to day-to-day temperature and precipitation activity, whereas climate is the term for the averaging of atmospheric conditions over longer periods of time. When used without qualification, “weather” is generally understood to mean the weather of Earth. Weather is driven by air pressure, temperature and moisture differences between one place and another. These differences can occur due to the sun’s angle at any particular spot, which varies with latitude. The strong temperature contrast between polar and tropical air gives rise to the largest scale atmospheric circulations: the Hadley Cell, the Ferrel Cell, the Polar Cell, and the jet stream. Weather systems in the mid-latitudes, such as extratropical cyclones, are caused by instabilities of the jet stream flow. Because the Earth’s axis is tilted relative to its orbital plane, sunlight is incident at different angles at different times of the year. On Earth’s surface, temperatures usually range ±40 °C (−40 °F to 100 °F) annually. Over thousands of years, changes in Earth’s orbit can affect the amount and distribution of solar energy received by the Earth, thus influencing long-term climate and global climate change. Surface temperature differences in turn cause pressure differences. Higher altitudes are cooler than lower altitudes, as most atmospheric heating is due to contact with the Earth’s surface while radiative losses to space are mostly constant. Weather forecasting is the application of science and technology to predict the state of the atmosphere for a future time and a given location. 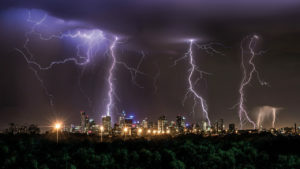 The Earth’s weather system is a chaotic system; as a result, small changes to one part of the system can grow to have large effects on the system as a whole. Human attempts to control the weather have occurred throughout history, and there is evidence that human activities such as agriculture and industry have modified weather patterns. Studying how the weather works on other planets has been helpful in understanding how weather works on Earth. A famous landmark in the Solar System, Jupiter’s Great Red Spot, is an anticyclonic storm known to have existed for at least 300 years. However, weather is not limited to planetary bodies. A star’s corona is constantly being lost to space, creating what is essentially a very thin atmosphere throughout the Solar System. The movement of mass ejected from the Sun is known as the solar wind. The term season is used to describe the changing weather and climatic conditions that are caused by the revolution of the earth around the sun. When the earth moves around the sun, some parts face away from the sun making them experience winter while those that face the earth experience hot airs causing changes in weather and climatic conditions. 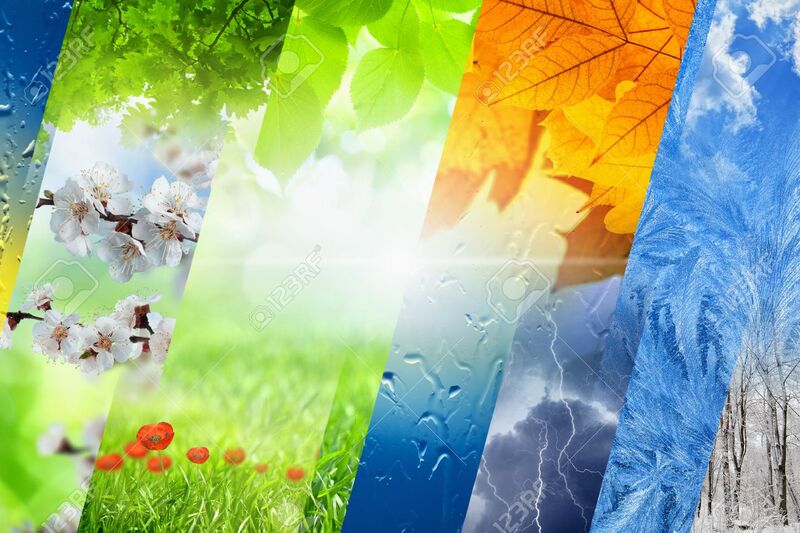 Weather describes the daily atmospheric aspects which include temperature, humidity, precipitation, rainfall, wind, and sunshine among others while season describes the weather conditions experienced for more than three months. Weather is caused by the changes in atmospheric pressure of a specific place, rotation of the earth on its axis, and topography while a season is caused by the revolution of the earth around the sun. Weather patterns of a specific region last for few hours and may end up lasting for a few days which means that weather cannot influence animals and plants thriving in a particular area. On the other hand, a season lasts for a significantly more extended period which is enough to influence animals and plants thriving in a specific region. 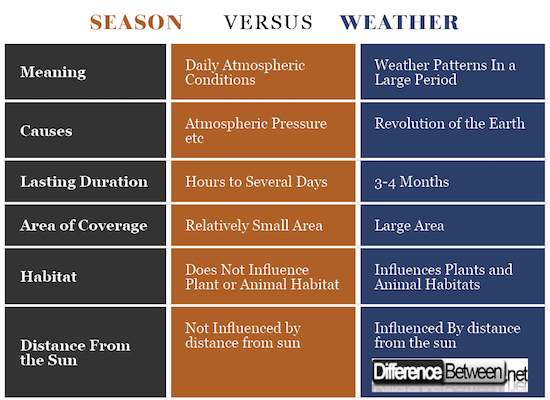 Other differences between a season and weather include the impact of the direct sunlight on each aspect and the area of coverage among other differences. Winter is the coldest season of the year in polar and temperate zones (winter does not occur in most of the tropical zone). It occurs after autumn and before spring in each year. Winter is caused by the axis of the Earth in that hemisphere being oriented away from the Sun. Different cultures define different dates as the start of winter, and some use a definition based on weather. When it is winter in the Northern Hemisphere, it is summer in the Southern Hemisphere, and vice versa. In many regions, winter is associated with snow and freezing temperatures. The moment of winter solstice is when the sun’s elevation with respect to the North or South Pole is at its most negative value (that is, the sun is at its farthest below the horizon as measured from the pole). The day on which this occurs has the shortest day and the longest night, with day length increasing and night length decreasing as the season progresses after the solstice. The earliest sunset and latest sunrise dates outside the polar regions differ from the date of the winter solstice, however, and these depend on latitude, due to the variation in the solar day throughout the year caused by the Earth’s elliptical orbit (see earliest and latest sunrise and sunset). Spring is one of the four conventional temperate seasons, following winter and preceding summer. There are various technical definitions of spring, but local usage of the term varies according to local climate, cultures and customs. When it is spring in the Northern Hemisphere, it is autumn in the Southern Hemisphere and vice versa. 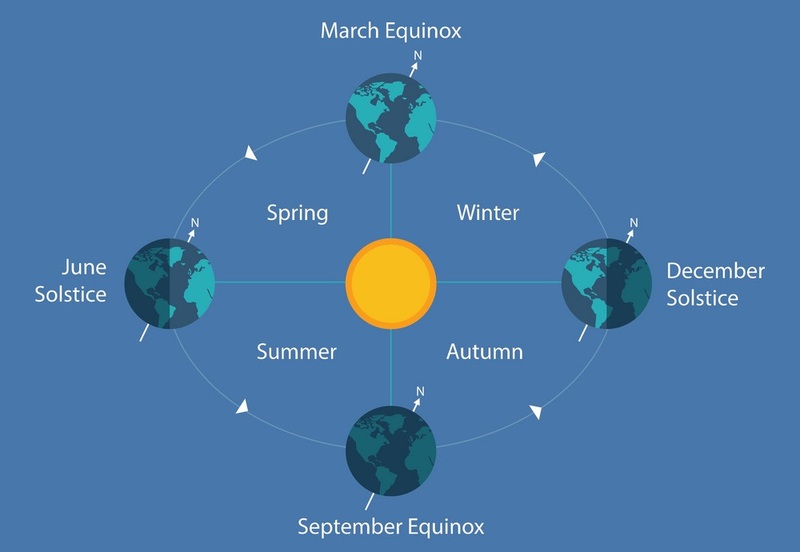 At the spring (or vernal) equinox, days and nights are approximately twelve hours long, with day length increasing and night length decreasing as the season progresses. Spring and “springtime” refer to the season, and also to ideas of rebirth, rejuvenation, renewal, resurrection and regrowth. Subtropical and tropical areas have climates better described in terms of other seasons, e.g. dry or wet, monsoonal or cyclonic. Cultures may have local names for seasons which have little equivalence to the terms originating in Europe. Summer is the hottest of the four temperate seasons, falling after spring and before autumn. At the summer solstice, the days are longest and the nights are shortest, with day-length decreasing as the season progresses after the solstice. The date of the beginning of summer varies according to climate, tradition, and culture. When it is summer in the Northern Hemisphere, it is winter in the Southern Hemisphere, and vice versa. Autumn, also known as fall in North American English, is one of the four temperate seasons. Autumn marks the transition from summer to winter, in September (Northern Hemisphere) or March (Southern Hemisphere), when the duration of daylight becomes noticeably shorter and the temperature cools down considerably. One of its main features is the shedding of leaves from deciduous trees. Some cultures regard the autumnal equinox as “mid-autumn”, while others with a longer temperature lag treat it as the start of autumn. Meteorologists (and most of the temperate countries in the southern hemisphere) use a definition based on Gregorian calendar months, with autumn being September, October, and November in the northern hemisphere, and March, April, and May in the southern hemisphere. There are four basic types of clouds. High clouds, middle clouds, low clouds, and clouds with vertical development. There are also clouds that don’t fall into any of these groups. Low clouds are from the surface to about 6,500 feet and are usually composed of water droplets unless temperatures are several degrees below freezing. Clouds on the ground are called fog. Middle clouds range from about 6,500 feet to about 20,0000 feet. They are also mostly composted of water droplets unless temperatures are cold. High clouds are above 20,000 feet and are composed of ice crystals. Click the link to get the whole story on clouds. Dust storms are created by winds moving across an arid region. Many times a strong dry cold front is the mechanism that creates the dust or sand storm. 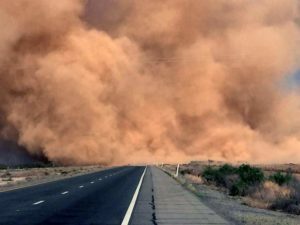 As strong winds move across an arid landscape, sand or dirt is picked up from the ground. Sometimes the lighter dust particles can be lifted up to 20,000 feet high into the atmosphere. A classic example of this is a sand and dust storm that develops over the Sahara desert. Easterly winds may carry the dust particles across the Atlantic ocean to the Caribbean Islands or Florida. Severe sand and dust storms can obscure visibility to zero and last for days. Fog is a stratus cloud on the ground. 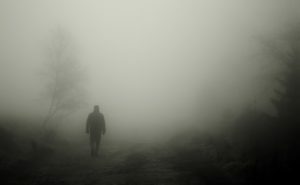 There are several types of fog. Advection fog is produced by a hortizontal motion of warm moist air over colder ground. An example of this would be a warm front moving across land with a recent snow or cold weather. Radiation fog is produced as heat from the earth surface is radiated back to space at night. A moist layer and nearly calm winds need to be present. Wind can mix in dryer air aloft, keeping the air below the saturation point. Steam fog forms when cold air moves over relatively warm water. This can be observed as wisps of “steam” rising from lakes, rivers or oceans when a cold air mass moves in. Upslope fog occurs as air is pushed up a mountainside and becomes saturated so that condensation occurs. Freezing rain – known as “ice” occurs when a thin layer of freezing or below freezing air exists near the earth’s surface. Typically this occurs when snow falls into warmer air changing the precipitation into rain. 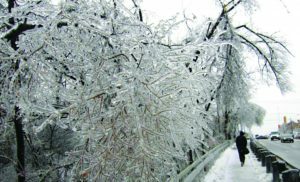 If a very thin layer of freezing air is present near the ground the rain will freeze on objects such as power lines, trees, and cars. Ice accumulations begin to cause serious problems when the ice is 1/2″ or greater on objects. The exact processes that creates hail are still being studied. Traditionally, textbooks showed hailstones being formed as a water droplet was carried aloft with an updaft into subfreezing air and freezing. As the ice moved into a downdraft, more water coated the hailstone. The cycle continued with the hailstone continuing to grow with each ride up and down the updraft and downdraft. More recent studies suggest that super cooled water droplets are carried aloft by strong updrafts in thunderstorms. A small ice particle forms and grows as “waves” of supercooled water droplets continue to bump into the ice particle. A new coat of ice grows with each cycle. The hailstone is kept aloft by the strong updraft. The stronger the updraft the greater the force to keep the heavier hailstones aloft. The hailstone eventually falls to the grown when the the weight is too great for it to remain aloft or when it gets pushed out of the updraft. Sometimes hailstones bump into each other while being bombarded with supercooler water droplets and stick together giving the hailstone a spiked appearance. The largest known hailstone fell on Vivian, South Dakota on July 23, 2010. The hail stone weighed 1.9 pounds and was eight inches in diameter. The previous record was from a storm on June 23, 2003 in Aurora, Nebraska and had a diameter of seven inches and weighed almost one pound. 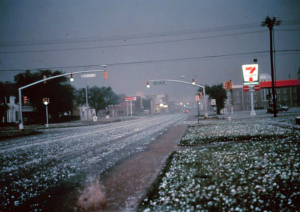 Another heavy hailstone fell in Coffeeville, Kansas on September 3, 1970. It weighed 1.7 pounds. Hail is considered severe when the diameter reaches one inch or quarter size. Sleet is transparent frozen raindrops. 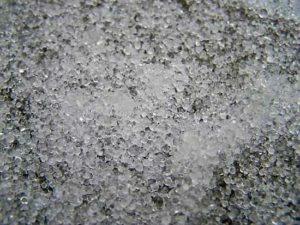 Sleet or ice pellets are created when snow falls into air above freezing and melts into rain drops. If another below freezing layer below the warm air is of sufficient depth, the rain drops freeze into balls of ice or ice pellets. Any significant amount of sleet is farily rare. 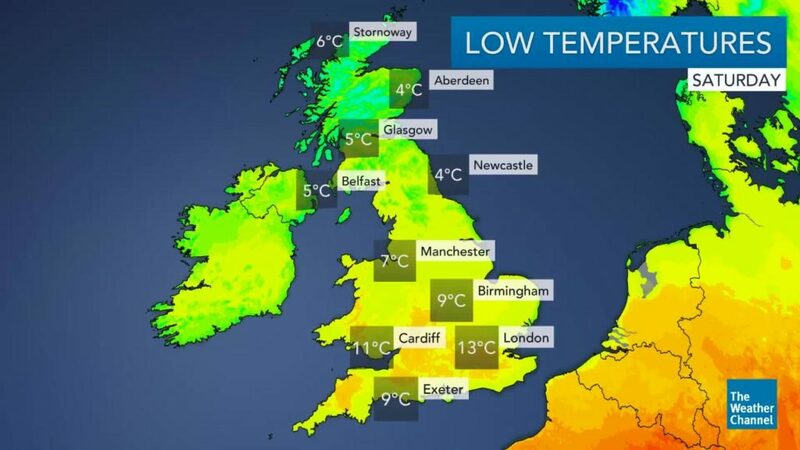 This is due to the fact that there needs to be just the right conditons to get a perfect layer of warm air in between the layers of cold air. There have been cases of storms producing several inches of sleet. A mix of snow and sleet and sleet and rain is more common. Snow is the accumulation of crystal snowflakes. Snowflakes are made as water ice crystalizes. The crystals may form in many different shapes dictated by the water content and temperature in the cloud as the snowflakes are forming. Snowflakes can take the shape of columns, dendrites, plates, needles and other six sided shapes. It is possible for it to snow several degrees above freezing if the air aloft is very cold and the above freezing layer is shallow near the ground. The greatest 24 hour snowfall in North America was 76″ Silver Lake, Colo. April 14–15, 1921. The greatest amount of snow for one storm in North America was 189″ at Mt. Shasta Ski Bowl, California, Feb. 13–19, 1959. The one season snowfall record for North America was 1,140″ at Mount Baker, Wash. 1998–1999. Sunny weather or clear skies is defined as less than 1/8 sky cloud cover. Mostly sunny skies is characterized by 1/8 – 2/8 sky cloud cover. Sunny skies many times are observed when a high pressure area is dominating the weather pattern. High pressure signifies a region of sinking air which tends to dry out the atmosphere resulting in less mositure to form clouds. Deserts are locations with sunny or mostly sunny skies due to high pressure systems influencing the weather pattern much of the year. Weather type 12 – Thunderstorm Thunderstorms are cumulonimbus clouds that produce thunder and lightning. 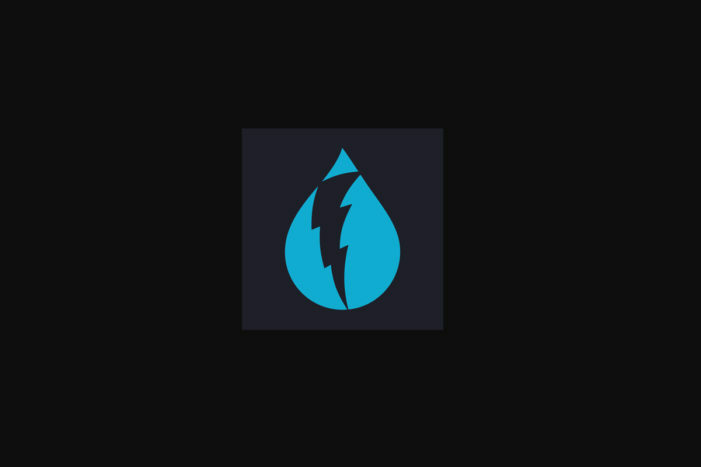 Discover more about thunderstorms here. 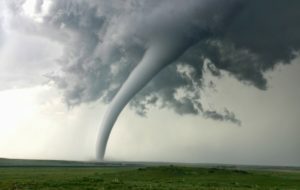 A tornado is a violently rotating column of air usually produced by severe thunderstorms. For much more about tornadoes, check out our tornadoes page. Wind is air in motion in the atmosphere. 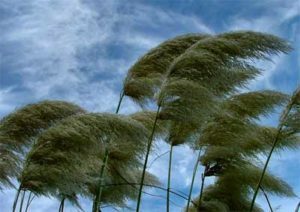 Windy weather is caused by an imbalance of heating in the atmosphere. It can be caused from an imbalance from solar heating or a difference over a boundary such as a front. The uneven heating generates an unbalanced pressure field. 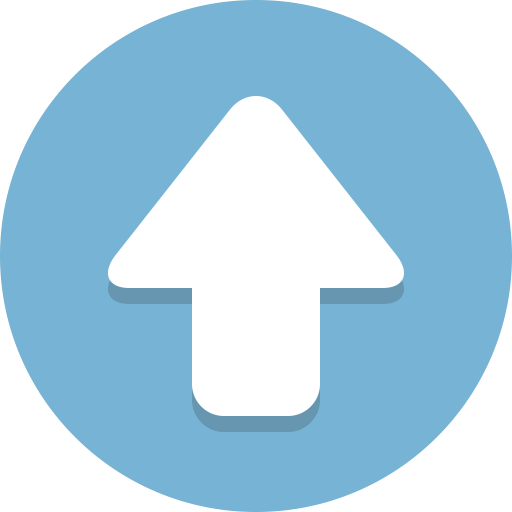 Air from a high pressure area flows toward a region of low pressure to balance the pressure field. A wind vane points to the direction from where the wind is blowing from and an anemometer measures how fast the wind is blowing. The strongest surface wind gust was 253 mph on Australia’s Barrow Island during Cyclone Olivia in 1996. The previous wind record was 231 mph set on top of Mount Washington, New Hampshire on April 12, 1934. Photographs courtesy of Rich Johnson and the Sydney Morning Herald. The way we have been forecasting has been essentially flawed. The atmosphere is a chaotic system, in which small uncertainties in how we start the forecast (the initialization) have large impacts on the forecasts. Thus, all forecasts have uncertainty and the uncertainty generally increases in time. Ensemble Forecasts – Weather forecasters need to tell users about the uncertainties in the forecast. Give forecasts in terms of probabilities. There is an approach to handling this issue that is being developed by the forecasting community. Instead of making one forecast, make many forecasts and each with a slightly different initialization or different model physics. Possible to do this now with the vastly greater computation resources that are available. The ensemble mean is more accurate than any individual member. 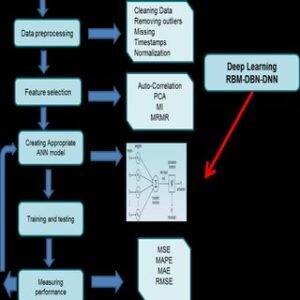 Ensembles will dominate forecasting in the future. A description of current weather and a short‐term forecast varying from minutes to a few hours; typically shorter than most operational short-range forecasts. 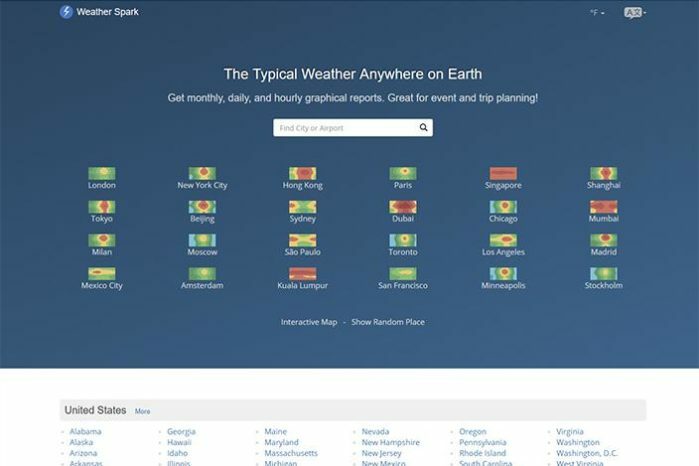 During the past decade or so the geographical and temporal specificity of the information that the weather profession can provide has greatly increased. 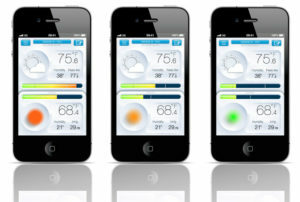 Smartphones – Ideal for Weather Data Delivery. 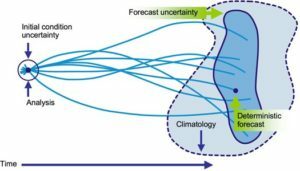 The Weather Adaptive Society – Advances in computation, control, and communication allows society to react quickly and effectively to weather information. At the same time, weather forecasts will rapidly improve. Together they allow effective real-time weather adaptation. Power Generation – Coordination of power generation by weather-sensitive renewables and reserve power sources (e.g., hydro, gas turbines). ← Is Wireless Power possible? Along with almost everything that seems to be building within this specific area, a significant percentage of opinions happen to be very refreshing. However, I am sorry, because I do not subscribe to your entire theory, all be it refreshing none the less. It appears to everyone that your opinions are generally not entirely justified and in reality you are your self not even wholly certain of the point. In any event I did appreciate reading through it.